“This is a time of turmoil, transition and transformation; a time when time itself is not on our side,” he said, emphasizing that people wanted jobs and prospects for a decent life. Yet all too often, what they got instead was divisiveness, delay and denial of their dreams and aspirations. He said that the very make-up of the current General Assembly was evidence of the new thirst for progress, as many Heads of State were attending the annual event for the first time — “new leaders, installed by new voices, and expected to take decisive breaks with the past.” Their people wanted to see results now, not in the distant future. “The United Nations rightly faces the same scrutiny, the same impatience, the same demands for accountability,” he continued, saying that the world’s people did not look to the Organization to be a mirror simply reflecting a divided world. People wanted solutions today. They wanted ideas, leadership and concrete hope for the future. “Our duty is to respond to these frustrations and yearnings,” he said, underscoring that his action agenda highlighted five imperatives: sustainable development, prevention, building a more secure world, helping countries in transition and empowering women and youth. He went on to acknowledge some important steps forward had been taken on many of those fronts: democratic transitions were under way in the Arab world, Myanmar and elsewhere; Africa’s economic growth was outpacing that of virtually all other regions; and Asia and Latin America were making important advances. Yet, the level of ambition must be raised. “We need more from each and every one of you. And the world needs more from our United Nations,” he said, stressing that sustainable development was the key to humankind’s hopes for the future. Yet the misuse of resources threatened the planet’s limits; ecosystems were reaching their breaking point and “the world’s best scientists are telling us we should change course before it’s too late.” Secretary-General Ban recalled that yesterday, he had announced that the “Sustainable Energy for All” was ready to deliver tens of billions of dollars to enhance energy access worldwide. Tomorrow, he would launch the “Education First” initiative, and on Thursday he would launch a major scale up of funds to bolster the global nutrition movement. Further, he said that the partners that comprised the “Every Woman, Every Child” initiative had disbursed funds totalling some $10 billion. “We are proving on the ground that well-conceived partnerships are delivering results — results that none of us can deliver alone,” he said. The deadline for the Millennium Development Goals was little more than five years away and it was time for the international community to intensify efforts to eradicate extreme poverty. The economic crisis could not be an excuse for falling short on pledges made. Yet, even if the Millennium Goals were achieved, he said, “we still have a long way to go.” The recent United Nations Conference on Sustainable Development — known as “Rio+20” — had pointed the way forward, even towards a set of Sustainable Development Goals. He recalled that the targets set by the Millennium Declaration had sparked a global movement of mobilization for development. The new Goals must do the same, inspiring action across the world. He went on to say that climate change remained “a major piece of unfinished business,” and while Member States had agreed last year to reach a legally binding deal by 2015, they must make good on that promise. “Time is running out on our ability to limit the rise in global temperature to 2 degrees centigrade,” he said. Changing course would not be easy, but to see that only as a burden missed the bigger picture. Indeed, sustainability and the green economy offered compelling opportunities to promote jobs, growth, innovation and long-term stability. “The future we want can be ours — if we act now,” he said. Turning to peace and security matters, the Secretary-General said he remained profoundly concerned by ongoing violence in Afghanistan and the Democratic Republic of the Congo. Moreover, he urged Sudan and South Sudan to resolve all remaining post-secession issues. And while both Somalia and Libya had made respective important steps in the past year, those gains must be nurtured and sustained. “And we must keep our focus on preventing conflicts before they erupt and on settling disputes through peaceful means,” he said, also noting that while Myanmar’s leaders had shown courage and determination in moving on a path of democracy and reconciliation, that country faced many challenges that would require the support of the United Nations and the wider international community to overcome. Continuing, he said that the crisis in the Sahel was not getting sufficient attention and support. Poverty, fragility, drought and sectarian tensions were threats to stability across the region. Unconstitutional changes of Government were taking place all too frequently. Extremism was on the rise. Arms were easy to obtain, while jobs were hard to find. “The international community needs a major concerted effort to address this alarming situation,” he said, announcing that tomorrow he planned to outline the Organization’s integrated strategy, with regional Governments and organizations expected to fill in the details in the coming weeks. He urged delegations to support that initiative, and also said that the Sahel crisis highlighted the need to strengthen early warning systems. “We must do more to detect the tremors of distress facing the poorest and most vulnerable,” he said. Any such attacks would be devastating, he said, underscoring that the “shrill talk of war” in recent weeks had been alarming. Leaders had a responsibility to use their voices to lower tensions instead of raising the temperature and volatility of the moment. On other matters, he looked forward to a successful conference later this year on the establishment of a Middle East nuclear-weapon-free zone, and in that regard, stressed that Iran must prove the solely peaceful intent of its nuclear programme. In addition, the Democratic People’s Republic of Korea must move towards the de-nuclearization of the Korean peninsula. The Secretary-General also highlighted other pressing issues, and stressed that neither peace nor development could be achieved without human rights and the rule of law, women’s empowerment and the protection of children and the numerous declarations and treaties that had extended the “umbrella of protection.” Yesterday’s high-level meeting of the Assembly on the Rule of law had sent a strong message about the importance of international law, justice and institutions within and among nations. He said that over the past two weeks a “disgraceful act of great insensitivity” had led to “justifiable offence and unjustifiable violence”. “Freedom of speech and assembly are fundamental. But, neither of those freedoms is a license to incite or commit violence,” he said, noting at the same time that all too often, divisions were exploited for short-term political gains. “Too many people are tolerant of intolerance,” he said, urging the moderate majority to empower itself and reject bigotry. 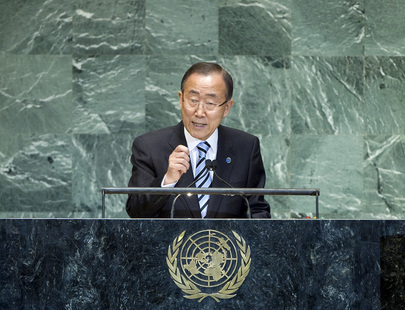 With so much at stake, the United Nations must continue to renew itself. “We must continue to deliver as one, cooperating across disciplines, structures and locations, building a global organization with a global presence,” he said. Staff mobility was a crucial first step and that initiative was long overdue. He said the Secretariat would be making a relevant proposal in the week ahead and he asked for the Assembly’s support. One of the aims was to ensure a streamlined budget. He also called for harnessing the full power of partnerships across the full range of the Organization’s work, and announced that he would shortly make proposals aimed at enhancing accountability and improving coherence. The Assembly’s support would be crucial to ensuring that the Organization met its many mandates. “You, the world’s leaders hold in your hands the power of State, the levers of Government. Your people expect you to listen to their aspirations and to unleash their energies and ideas,” he said, emphasizing that the world expected political leaders to work with each other for the common good. While no one could do everything, every individual, in their own way, could do something. Together, if everyone upheld their responsibilities, today’s tests could be met, opportunities could be grasped, and new life could be given to the purposes and principles of the United Nations Charter, he declared.